meshStack enables your employees to provision cloud resources from private and public cloud environments in a self-service manner. A user interface offers resources across locations and technologies, while enabling flexible management of roles and access rights. meshStack is a governance metalayer that lies on top of the connected cloud platforms. It provides a consistent overview on the use of cloud resources that are administered from a single UI. Access rights and quota can centrally be configured on the platform and will automatically be replicated to all underlying platforms. A Meshproject in the portal gathers all resources that belong together across platforms and locations. 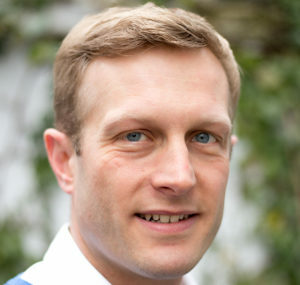 That enables you to be aware of access rights on the systems. You can flexibly grant or retrieve access rights in order to ensure safety and transparency in regard to privacy. Users get single-sign-on access to the portal to access all projects and resources - across locations and technologies. 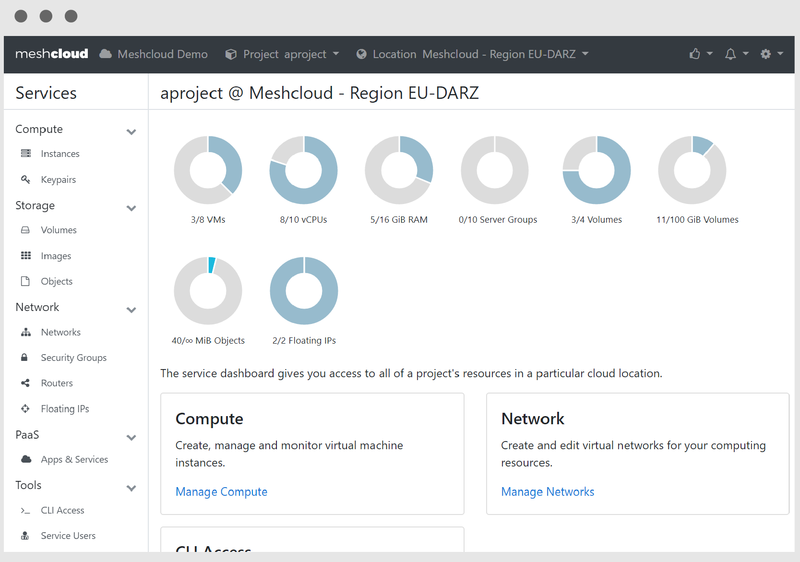 meshStack lets your employees book cloud services at any time while considering quota settings on division or project level. New users can be invited to and removed from projects by project administrators. Existing local directories can be connected for an efficient onboarding process of your employees. While adding administrative functionalities, meshStack provides direct access to the native cloud-platform APIs (e.g. 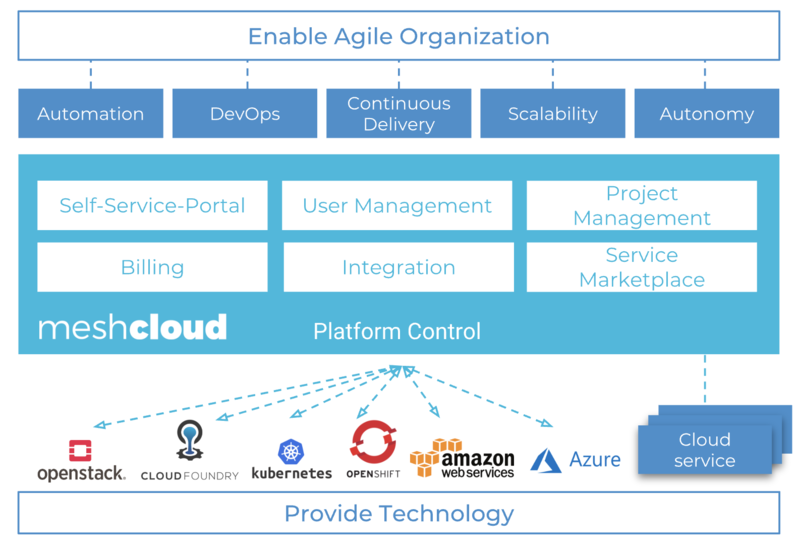 the Cloud Foundry or OpenStack API). This allows you to use platform specific tools, such as command-line tools without any changes. 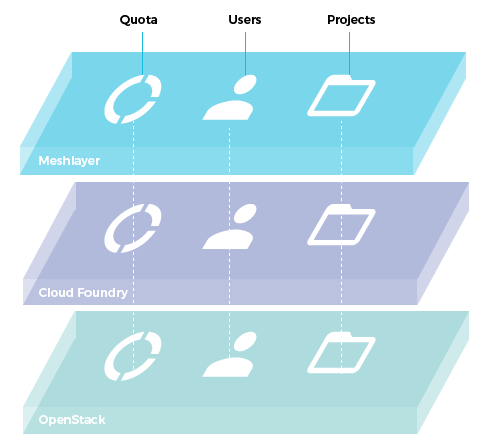 meshStack automatically replicates project-, quota-, and user settings into the connected cloud platforms. It translates configurations to the target platforms and makes use of platform-specific control structures. This ensures that technical configurations are consistent with the state specified by your teams within meshStack. Openstack and Cloud Foundry are integrated by default. However, we can integrate further platforms on-demand. 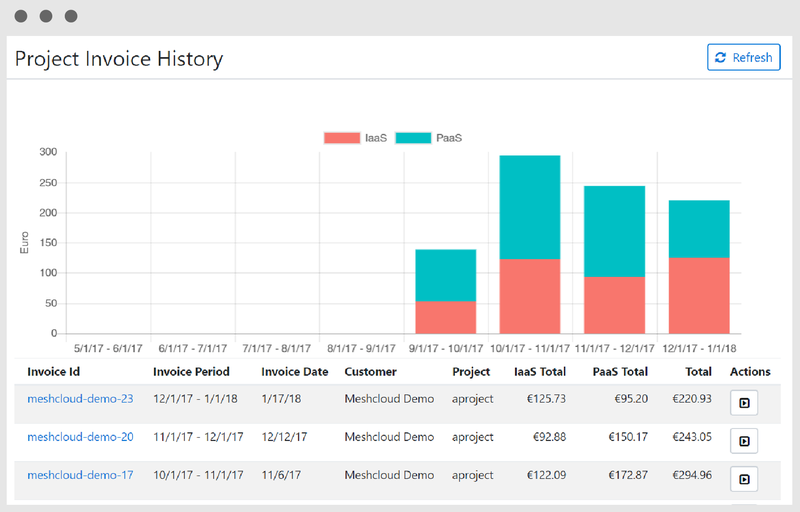 meshStack includes a billing component that is applicable to internal allocation as well as external cost comparisons. It measures resource usage within the integrated platforms. Prices are defined in a service catalog meshStack billing module. All costs are aggregated on a project-level and can be exported as PDF. meshStack includes a modular user interface that integrates all available cloud services. The web interface is based on state-of-the-art web technologies and is easy to use. 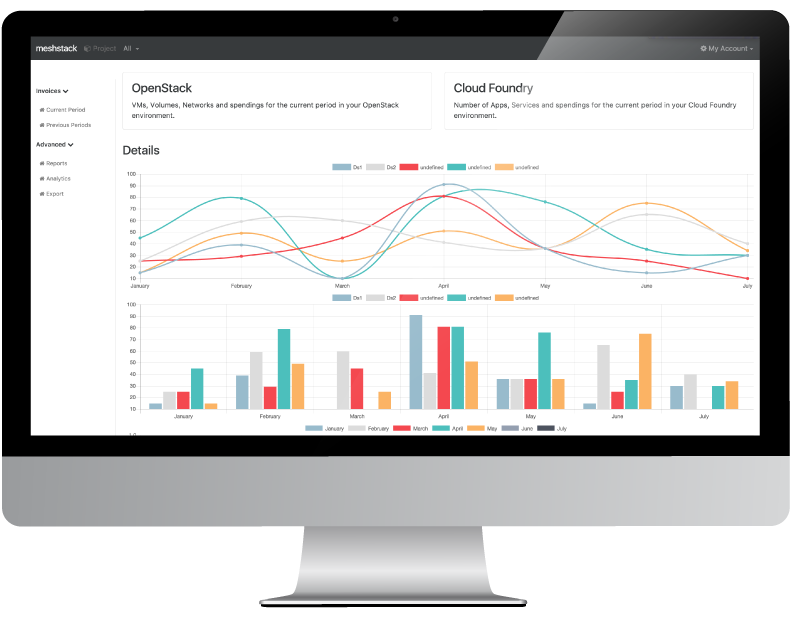 You can orchestrate OpenStack resources and Cloud Foundry apps from meshPanel. Furthermore additional sevices can be added and functionally integrated (SSO, Project Management, Billing, etc.). The underlying APIs can directly be accessed. 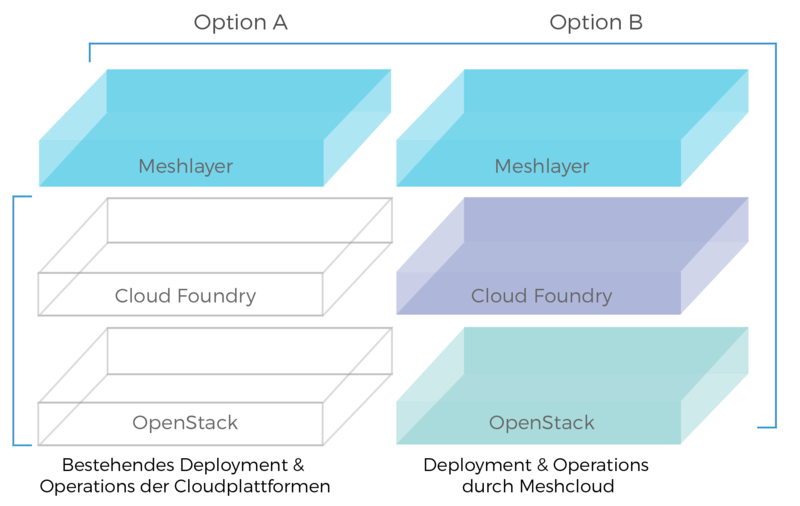 We can deploy meshStack on a variety of existing cloud infrastructure such as OpenStack, Cloud Foundry or other IaaS or PaaS layers. Either way, we will make sure that you receive a comprehensive cloud solution that lets you start your application operations from day 1. With our fully automated deployment pipeline you will continuously receive new features to always be up-to-date. In this way, we can quickly respond to functional requests and fastly integrate required extensions. 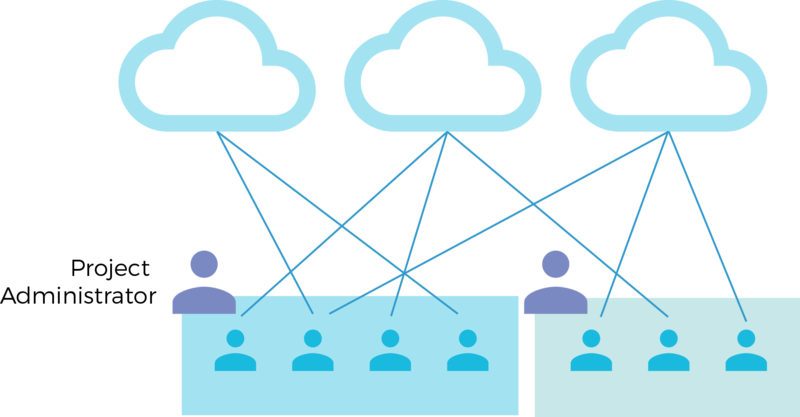 meshStack's pricing contains a monthly fee per multi-cloud project, independant of the number of users. The exact price depends on the booked functionality and activated modules. You continuously receive platform improvements and support. We are looking forward to learn about your requirements and are happy to create an individual offer for you. Please send us a message. We offer support via our meshcloud ticketing system or individual support agreements. Feel free to contact us to discuss the best suitable options.